Heads Up Andon Display System | Advanced Engineering, Inc. 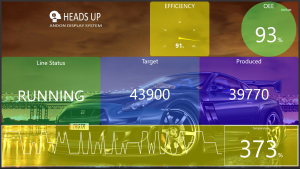 The Heads Up Andon Display System from Advanced Engineering, Inc. is an industrial digital signage software package. Its intended purpose is to provide visuals that display up-to-date production related information in a manufacturing environment. These visuals will work on any size display that is connected to a web enabled device with a HTML5 browser. Heads Up will allow you to leverage the automation in your plant in order to provide real time displays, on any size screen, wherever they are needed. While intended for the manufacturing sector, Heads Up can be used in non-automated environments. It is a database driven system. Any application where the values/content that need to be displayed can be piped through a database, it will work. 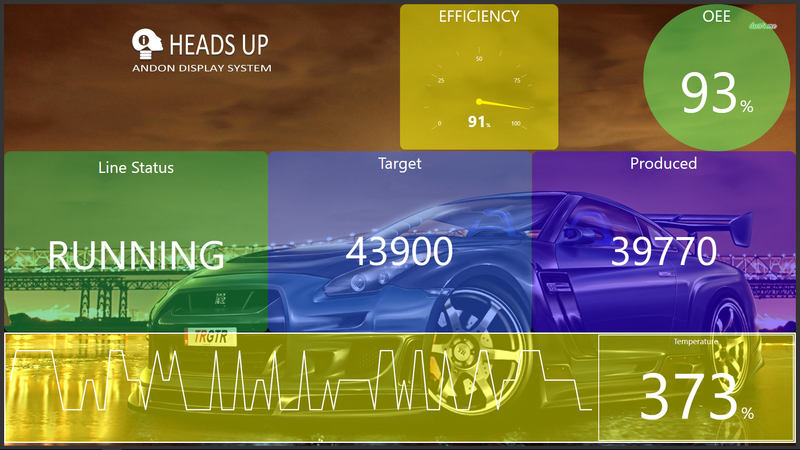 At the heart of the Heads Up Andon Display System is a flexible tag database. A user creates tags in the system and can map them to display widgets used to configure Andon screens. Tag values can be updated using any mechanism capable of connecting to the tag database or calling a web service. Various tag data types are allowed to provide a rich look to your custom displays. Displays are built using drag and drop from our Widget library. Each widget’s functionality is driven by data stored in the Heads Up tag database. Build your tags, build your screens and you are ready to deploy! 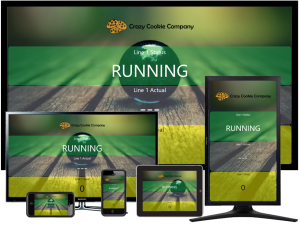 Runtime mode to show displays full-screen without toolbars, etc. Click below to download the a white paper with more information. Would you like to see a live ONLINE demo of Heads Up? Email us and we can make it happen. No special software required, just an HTML5 browser. Don’t see exactly what you need? We can easily customize an Andon display solution for your plant. Email us today and ask about our Andon display solutions! Copyright © 2019 Advanced Engineering, Inc.. Powered by WordPress. Theme: Spacious by ThemeGrill.